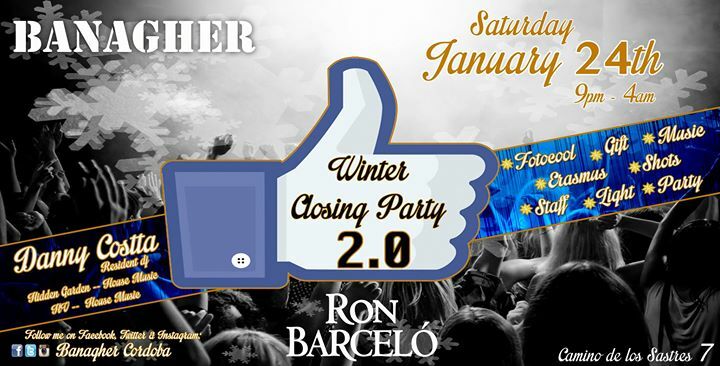 Banagher Córdoba presents WINTER CLOSING PARTY ★★★ “2.0” ★★★ “SATURDAY JANUARY 24TH” @ Banagher, Córdoba ▸ This party is gonna be the second edition, the first one was wonderful, the ★★★ “2.0” ★★★ it will be AWESOME!! ▮ And the best party ever!! The best bar in Cordova!! HASTA PRONTO EN EL MEJOR BAR DE CORDOBA ! !